BELGRADE – Rabbis Aharon Leib Shteinman and Chaim Kanievsky, two of the ultra-Orthodox public's most senior rabbis, are offering a religious explanation for the growing anti-Semitism in Europe, arguing that the polarization between the Jewish people and other nations is reinforced thanks to "Divine Providence" – in order to prevent mixed marriages. In a letter sent to the participants of the Conference of European Rabbis, who are meeting in Belgrade this week, the two rabbis wrote that "getting close to gentiles is a sore evil, as we learn from their acts and – God forbid – eventually assimilate between them. When they get close, God separates between them by increasing the nations' hatred." In a message to community rabbis, the two haredi leaders called on them to "Stress these issues in order to distinguish between the Jewish people and the world's nations." The letter was read to the conference participants by its president, Rabbi Pinchas Goldschmidt, in one of the highlights of the Conference of European Rabbis, who view it as a personal guidance for dealing with Jews' situation in the continent in light of the restrictions imposed on ritual slaughter and circumcision by the authorities and the increasing acts of anti-Semitism among the local population. Alongside the usual words of encouragement ("only by strengthening the study of Torah and observing its mitzvot we will be able to stand up to those seeking to harass us"), the two rabbis analyzed the causes of the persecutions and offered tactical ways for dealing with them. "Even in places where the hatred is not expressed on the outside, when he sees a Jew who succeeds in what he does, he is jealous of him and his heart turns over to hate him," they wrote. "And so the world's nations, when they see the success of the Jewish people, they envy us and hate us – and that is the father of all reasons for anti-Semitism." The rabbis instruct the Jews, therefore, to practice modesty in "material issues" and not to act extravagantly – especially in times of financial crisis. "In the places where we didn't see such hatred, it was because their economic situation was good," they explained, "but once their situation has taken a turn for the worse and they see the success of their Jewish neighbor, they are filled with hatred." "Here too, when we encounter such a situation, we must try to explain using refined language, and not to provoke them." As for the "shechita decree," they wrote that in some countries ritual slaughter had already been banned, and some were seeking to ban it – and how could Jews live in a place where they were not free to slaughter livestock for meat according to their faith? "This entire decree is based on hatred and envy of the Jewish people," the rabbis argued, "yet it is wrapped with false arguments about preventing cruelty to animals." They ruled that "for the essence of the shechita we must fight to that they don't change even the most insignificant detail, God forbid." They stressed, however, that their guidance to act moderately for tactical reasons applied to this issue as well. "Plead with the countries' leaders and try to persuade them to leave us alone and let us continue what we received from Moses, without the slightest deviation and without provoking the nations." Rabbi Goldschmidt noted that the Conference of European Rabbis' decision to award the 2013 Lord Jakobovits Prize for European Jewry to German Chancellor Angela Merkel was done in this spirit, in a show of gratitude for her actions to allow circumcision in her country despite the hostile media and public atmosphere and with the hope that she will continue standing by the Jews during future times of crisis. Goldschmidt said that Merkel was very happy to hear that she had been selected to receive the prestigious prize. 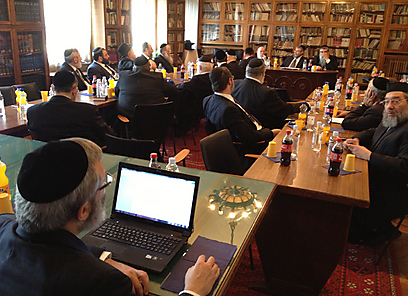 Ukraine's Chief Rabbi Yaakov Dov Bleich briefed the members of the Conference of European Rabbis' standing committee on the situation of anti-Semitism in Europe, focusing on Greece Hungary, where he said the phenomenon was only growing. According to the rabbi, in those two countries anti-Semitism is not fueled by Muslim elements (as it is in countries like France and Sweden), which proves that it stems from pure hatred of Jews rather than a response to Israel's policy in the territories. Rabbi Bleich added that the Hungarian Jewry was being persecuted to such an extent that its members were afraid to talk about the situation of anti-Semitism or criticize the government on different matters. "A Hungarian Jew was asked about it during a discussion in the US, and he said that everything was just fine," he said. "It was really frightening hearing that." The rabbi added that some 100,000 members of the Jewish community in Hungary and thousands of Israeli students studying there were living in danger. He mentioned the drawing up of lists of prominent Jews, the attempt (which was thwarted at the last minute) to hold a provocative march on the eve of Holocaust Day under the title, "Give Gas," and the decision to honor a person known for his anti-Semitic views with a prestigious national award. As part of the three-day convention, the 40 participants – rabbis of European countries and major cities d senior religious judges in the continent – met with Serbian President Tomislav Nikolic and held a ceremony at the Semlin concentration camp in memory of the victims of the Holocaust of Yugoslavia's Jews. See all talkbacks "Rabbis: Act modestly to stop anti-Semitism"